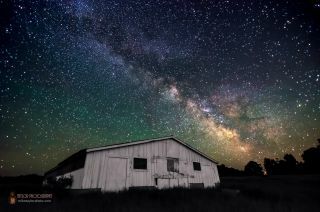 Mike Taylor sent SPACE.com this image of the Milky Way over rural Maine. He used a Nikon D7000 camera and a Tokina 11-16mm at 11mm, f/2.8, 25 sec, ISO 1600 on June 10, 2013 to capture the image. A veteran astrophotographer in Maine took advantage of a clear night sky in rural Maine to capture two beautiful images of our host galaxy, the Milky Way. "Living in rural Maine offers me some great opportunities to capture the beauty of our night sky with mostly very little light pollution. This spot at the top of a ridge in the small town of Palermo is a great example," photographer Mike Taylor wrote SPACE.com in an email. "On this particular night there was quite a show of green airglow in the sky and a just a bit of yellow/orange glow from nearby towns on the horizon." The first photo is a single image capture, while the second image is a composite of 81 frames from a static time lapse of the Milky Way Galaxy in the night sky. Taylor stacked the frames of this sequence to make a standard star trails image and then blended/masked in a single frame of the Milky Way. The processing was done with Lightroom 4 and Photoshop CS5. He used a Nikon D7000 camera, Tokina 11-16mm at 11mm, f/2.8, 25 seconds, ISO 1600 on June 10, 2013 to capture the images. Mike Taylor sent SPACE.com this photo, which is a composite of 81 frames from a static time lapse of the Milky Way moving across the sky over rural Maine. Taylor stacked the frames of this sequence to make a standard star trails image and then blended/masked in a single frame of the Milky Way. He used a Nikon D7000 camera and a Tokina 11-16mm at 11mm, f/2.8, 25 sec, ISO 1600 on June 10, 2013 to capture the image.